I've got some EXCITING NEWS! Briogeo launched at Sephora making it super convenient to stock up on these amazing hair products! Here's the scoop! 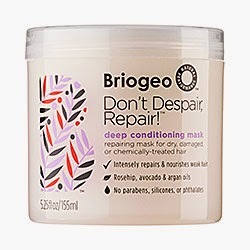 New York, NY (June 2014) – Since hitting the market less than a year ago, Briogeo Hair Care, pronounced [bree-oh-jhee-oh], has been quickly gaining clout with beauty industry experts and conscious consumers alike. The brand, whose high-performance, plant-based formulas have captured the hearts (and heads) of many, is proud to announce its launch at Sephora stores and Sephora.com this September. This fall, Briogeo will lend a helping hand to the curly girls. The texture-specific lineup will take the guesswork out of mixing and matching products by helping curly consumers formulate the perfect concoction of products to perfectly define, de-frizz and nurture their curls. · Rosarco™ Oil (Sephora exclusive): A lightweight 100 percent natural and silicone-free hair oil blend comprised of rosehip oil, argan oil and coconut oil for superior shine, nourishment and hair resiliency, available exclusively at Sephora and Sephora.com. · Be Gentle, Be Kind™ Avocado + Quinoa Co-Wash: A crème-based cleanser for textured and curly hair that effectively cleanses and moisturizes the hair without stripping it of its natural, protective oils. · Curl Charisma™ Rice Amino + Avocado Leave-in Crème: A finishing, leave-in conditioner for curly to wavy hair that protects from frizz all day, while enhancing the form, definition and hydration of curls. All of Briogeo’s formulas contain performance-based, natural ingredients and are free of SLS, parabens, sulfates, phthalates and silicones. Each formula is fortified with the finest blends of natural plant and fruit extracts, oils, antioxidants and hair healthy vitamins and packaged in Briogeo’s award-winning, eco-chic bottles, made with 25 percent post-recycled plastic. The brand’s full range of products, including curl-specific, volumizing and repair products, will also be retailed on Sephora.com beginning August 2014. Briogeo is a naturally based hair care collection that combines the best of science and nature to create high performing hair care formulas for a diverse array of hair texture types. All of Briogeo’s formulas are made in the United States and contain at least 95 percent natural and naturally derived ingredients. Briogeo retails at fine salons and boutiques nationwide including at NewBeauty at Fred Segal, The Cosmetic Market, Brownes Merchants & Trading Co. and online at BriogeoHair.com. For more information, please visit BriogeoHair.com. Visit us on Facebook.com/briogeo. Join the conversation on Twitter.com/briogeohair. This looks amazing, definitely adding it to my wish list!